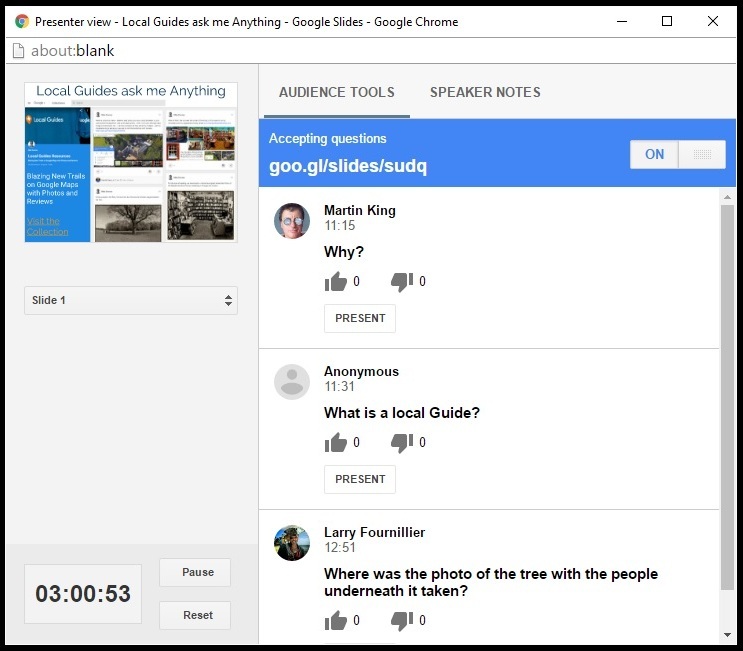 mike downes - we make videos to help people learn: Google Sides Audience Questions Feature - How many ways are there to use it? Backchannel .. Since the beginning of time, whenever one person speaks to a group, like a class of students, a press briefing or even at a rock concert - those crafty people in the audience will often strike up a secondary minor conversation. A teacher may berate a child (or an adult), that is until they realise a backchannel is healthy. My fondest memories in school, when I've caught the eye of someone and started off some fun stuff like passing notes around or flicking stuff around. Fast forward to the last ten years and we have TV Shows following a hashtag on twitter and claiming it's trending.. I've posted about it on google+ 8 Jan 2012 - all to do with Hangouts. 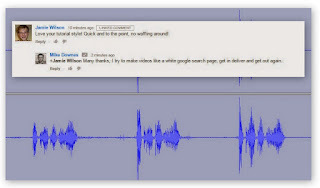 Seems the phrase can be tracked back to the 1970s, Backchannel is the practice of using networked computers to maintain a real-time online conversation alongside live spoken remarks. The term was coined in the field of Linguistics to describe listeners' behaviours during verbal communication, Victor Yngve 1970. Cliff Atkinson wrote a book The Backchannel: How Audiences are Using Twitter and Social Media and Changing Presentations Forever which explores the impact of the backchannel on live presentations, and describes practical steps that presenters can take to engage the changes (Dec 2009). Google Moderator .. Short story, let's go back to Sept 2008 when Google had about 20,123 staff members. I believe Larry and Sergey did this TFI Friday style question and answer (as they still do today I think). What started as a handful of googlers in one room spewed it's way to thousands spread across the planet. There's a great video filmed Dec 1999. They had a big problem, at 5pm on a Friday that could not answer 1,000s of question sent in during the course of a week. So thankfully a few googlers solved it (read wiki for more details). 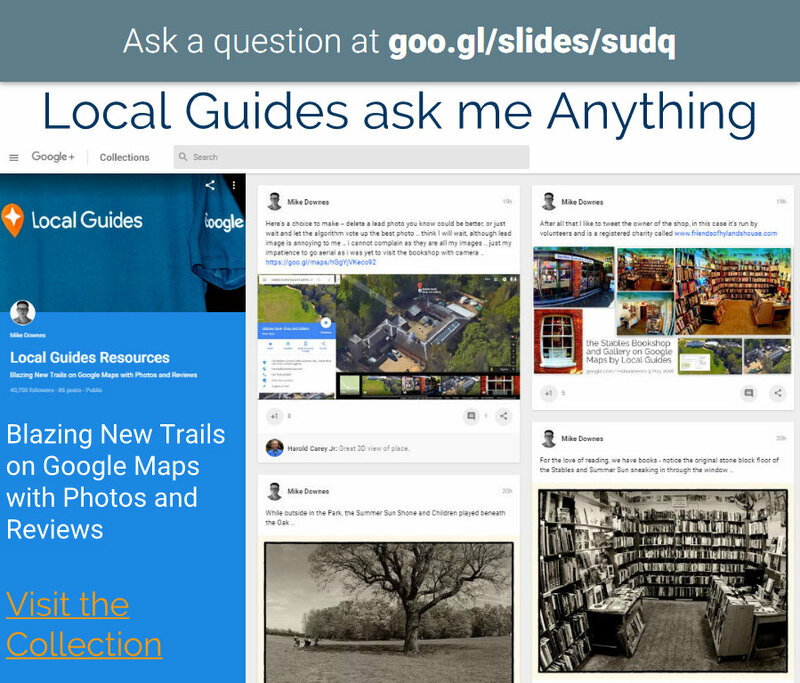 A new moderator link was opened every week and other googlers added a question and voted on other people's questions. All Larry and Sergey had to do, start at the top with most popular question and work down. This idea quickly gathered steam and President-elect Obama used in in December 2008. A million votes from 20,000 people from 10,000 questions. They ran it again, 4.7m votes, 100k people from 76k questions. Quite popular then. I dislike phrases like, Google Moderator was shut down on June 30, 2015 because the usage did not match Google's expectations. I believe this to be a cheap shot and out of context. The internet is vastly changing and everything at the start leads to something else, albeit in a different form. 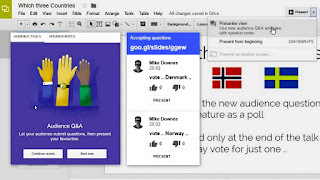 Enter the Hangouts On Air - Audience Questions App. I've been a trusted tester for Hangouts prerelease software for four years (I'm allowed to say that). In late 2012 for testing and development and then publicly in Sept 2013 the Questions and Answers App was launched (13 Sep 2013, David Bennett post). And guess what -- it was built on and alongside Google Moderator. open the App, ask a question and vote on other people's questions too. 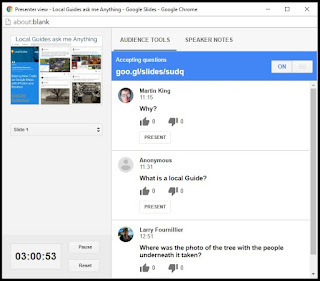 Google Docs Slides Audience Questions .. Letting the dust settle for a few years and no doubt letting the folks at google docs do some whiteboarding and chin scratching has lead us once again to Audience Questions - this time with Slides. If you have not already, have a read of the release blog post at google docs and the google for work blog. It's the same App as Hangouts and the same service as Moderator - ask a question and vote on other people's questions. On a personal note as a teacher, I have never, like never really liked these presentation tools as find them incredibly restrictive. My style of teaching is to turn up, have a bunch of ideas and just go for it. I think on my feet and have to respond to an audience. Teaching children in over eighty schools, often in Inner Cities has hardened me to some tough crowds. If an idea was not working, you need to change it and change it fast or else face stuff being thrown around or a fight breaking out. Back to those tools, you know the sort: death by powerpoint, the oh so cool zooming Prezi and how Slides used to be quite annoying to build (web based and slow bandwidth, thankfully now uber useful). Google Slides live on the web, can be shared as a URL (whether private, unlisted or public) and Published to the Web - which means embedded into a website or, and this is by far my favourite: HTML View. See this example: mike downes CILIP talk where all 65 slides are presented as one scrolling webpage - just beautiful. Ask Questions over a set time period, just like old school Google Moderator as used by the Google founders TFI Friday - open URL Monday morning, close it Friday at 5pm. At present, I believe Google Docs Slides cannot be used like this as it Lives in the Moment ie when and only when the Slide is open and in Present mode. I have a question in the Google Docs Help Forum about this - as yet no reply. So it's your Google Docs Slides Audience Questions - How are you going to use it? As a last sentence, Google have built one tool which allows many, like many interpretations. Educators will use it differently than business folks as will anyone else. I can only speak as a teacher when I say feedback and assessment from a class are the lifeline and raw material that keeps a teacher fresh, on their toes and acts as the golden mechanism to improve each and every lesson.